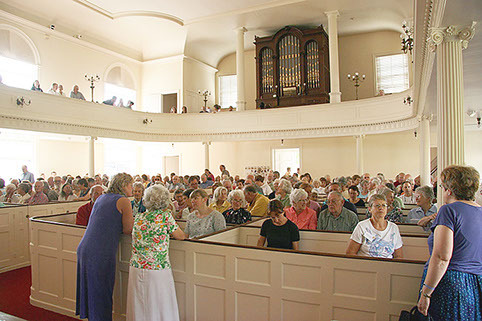 The congregation dearly cherishes this church built in 1825, and which now is listed on the National Register of Historic Buildings. The interior was partially changed in 1896. The pulpit was moved off-center, the sounding board was added, and the trompe l’oeil paintings of St. Peter and St. John were covered. The practice of renting the pews was discontinued in 1922. The parish hall and dining room/kitchen were added in 1930, a generous gift of the Morison family in memory of Anne, Theresa, and Mary Morison, and Ruth Morison Sharples. In order to guarantee a continued source of funds to repair the property, the PUUC congregation voted in 2006 to restructure the endowment into three funds: Building, Operating, and Service. Seventy percent of the endowment was placed in the Building Trust Fund. The custom is to draw out no more than 5% for yearly upkeep of the property. Since this vote, several significant changes to the property have been made. Most of these changes have been funded through the Building Trust Fund, Capital Fund Drives, and Foundation Grants through applications. Storm windows were added to the sanctuary in 2012, done by Andy Roeper Restoration for $13,000. These windows insulate the sanctuary and protect the almost 200-year-old windows. In 2012, the Peterborough fire marshal made a surprise inspection that resulted in a threat to withhold our occupancy permit unless significant safety changes were made. An area-wide appeal brought in $15,000 toward the total project of $26,000. A fire suppressant system and vent were installed over the stove. An emergency exit was added to the dining room. Emergency signs and lights were installed over all doors. When the oil furnace gave out in 2014, a team of church members did the necessary research to recommend the installation of a wood pellet boiler. This $27,000 project was funded by a generous donation of $20,000 from James Ewing in memory of his mother, Ruth, and by the NH Energy Commission.